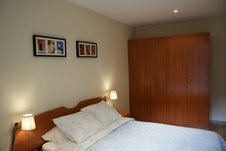 Beautiful apartment for up 6 people, located just 15 minutes to walk from the nicest beach in Barcelona and 8 minutes by metro from Catalonia Square. The apartment is near to the famous SAGRADA FAMILIA, and close to the Gloriès Shopping Center, Music Auditorium and the Placa de Toros Monumental. With a perfectly nice look and an amazing location, this apartment has heaps of holiday appeal for families and groups alike. You will feel at home. The living room is spacious, there is a sofa bed for two people, a bookcase and it has long windows onto the terrace. A TV, a HiFi/CD player, and floor fans are available too. A nice feature to this apartment is the terrace located just outside the living area. This area has table and chairs and is great for outside dinning. 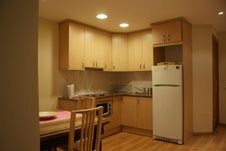 The kitchen is fully equipped with all the utensils for preparing and storing food. Also, you can find a washing machine, microwave, gas stove, and fridge. In this area, also there is a big wooden table with 6 chairs doing a nice space to socialise and enjoy. The master bedroom has 1 double bed, a large closet, sheets, towels and duvet comforters. From this bedroom you can reach the terrace just outside. 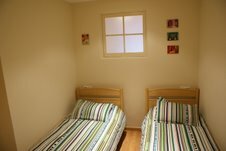 The second bedroom has 2 single beds (90 cm); and it is equipped with sheets, towels, duvet comforters and closet. There is one full bathroom with shower, basin and WC. CLEANING FEE: This apartment requires one time 60 euros cleaning fee. ADDITIONAL GUESTS: TWO additional guests are welcome to stay in the flat. 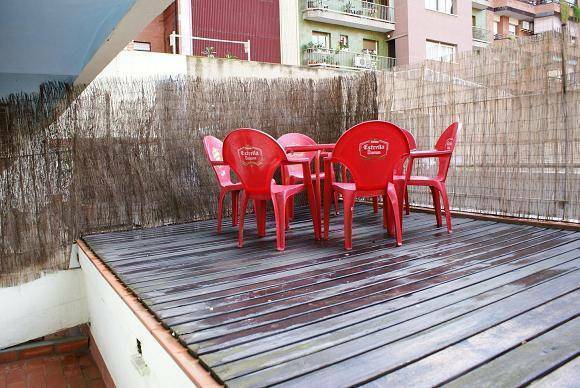 The apartment allows a maximum of 6 people. Price is 10 euros per night for each additional guest. Please, NOTE THE PRICE OFFERED ON THIS WEBSITE IS FOR 4 PEOPLE ONLY. If you want to stay 1-2 additional guests, please contact with us by phone or email in order to prepare the apartment properly. CANCELLATION POLICY: Any cancellations must be notified directly to the hostel by email at least 72 hrs in advance of your scheduled arrival time. Otherwise, the first night will be charged onto your credit card. If you cancel any individual night of your reservation, then the deposit for that night will be not be refunded or transferred. REMINDER: CALL US WHEN YOU ARRIVE TO BARCELONA to arrange the exact time to check you in and give you the keys. APT. MONUMENTAL is located at the ending of Barcelona Eixample, it is just 10 minutes walk from the nicest beach in Barcelona and the Port Olimpic. Or walk up Pg. de Gracia to Gran Via, go right and take the metro in 'Passeig de Gracia' Station (L2-Purple Line) and get off in 'Monumental'. Take the exit 'C. de la Marina and then walk down on 'Marina' to the corner with 'Ausias Marc'. Then turn left and walk 50 mts to number #157. From the corner the Pg. de Gracia and Gran Via, you can to take the bus #56 and get off in the corner of Gran Via with Marina. Then walk down on 'Marina' to the corner with 'Ausias Marc'. Then turn left and walk 50 mts to number #157. Take a taxi and ask to taxi driver to 'Ausias Marc with Marina it takes around 5 minutes. Or walk on DAlí Bei Street to Marina Street, then turn left and walk up to the corner of Marina with Ausias Marc. Then turn right, across the street and walk 50 mts to number #157 on the left hand side. Take the metro L5-Blue Line and get off in Sagrada Familia Station. Then, change to the L2-Purple Line Metro and get off in 'Monumental' Station. Take the exit 'C. de la Marina and then walk down on 'Marina' to the corner with 'Ausias Marc'. Then turn left and walk 50 mts to number #157.